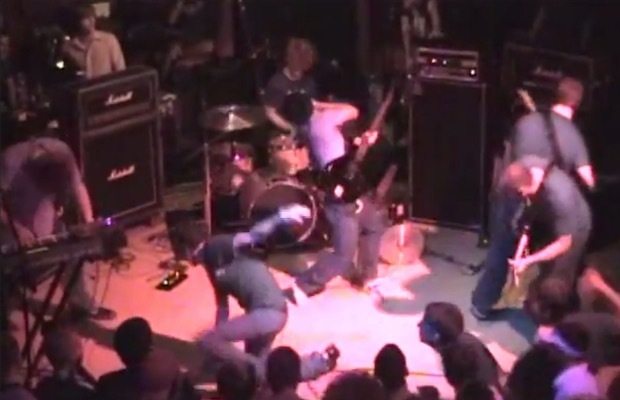 In 2002, metal powerhouses Zao embarked on a “farewell tour” of sorts with Unearth and Underoath. (Members of Zao focused on other projects following this run, only to reconvene with an updated lineup in 2003.) A good portion of the run was apparently filmed, but never officially released. It surfaced online in 2013 and contains some rare footage of Underoath during their younger years. If you're a fan of the band, then you probably know how difficult early footage of them is to come by. The tour followed Underoath's release of their first proper full-length album, The Changing Of Times, which hit the shelves in February of 2002 via Solid State Records. It marked the final effort to feature Dallas Taylor (who went on to form Maylene And The Sons Of Disaster) as their frontman. In the video below, you can find the band closing their set in Boise, Idaho with “Never Meant To Break Your Heart,” which is the album's fourth song.